I’ve made this card for the Ways to Use It challenge over at Splitcoast today. The challenge today…alter ribbon in some fashion. My thought…ribbon roses. I placed some plain white seam binding on a craft sheet and inked it with a Distress Ink. Next, it was spritzed with water and scrunched up in my hand. Then, I took my heat gun and dried it….instant vintage look ribbon! Next, I rolled the ribbon roses and placed little tiny drops of Crystal Effects on them to look like rain drops. Sorry, after taking 15 pictures and still failing to show them clearly…I’ve given up! My card base is a standard A2. 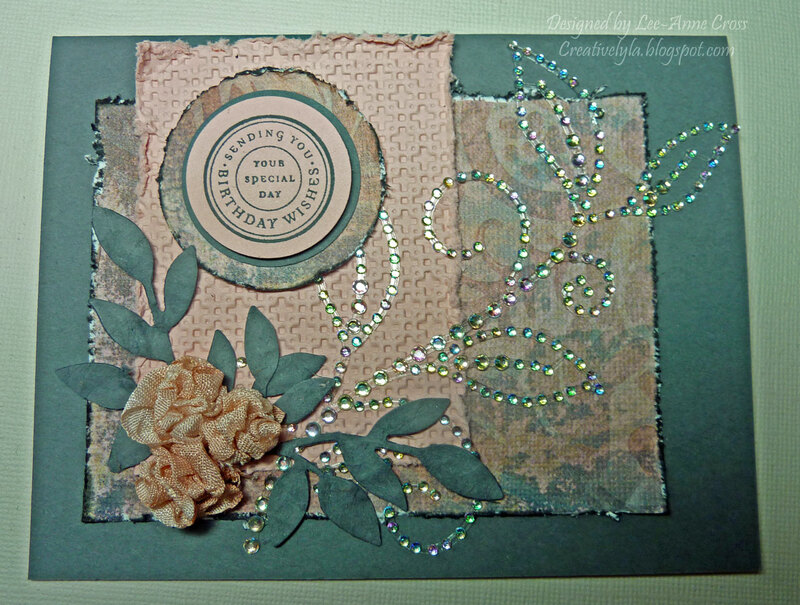 The next layer is a piece of designer paper that’s been distressed and inked, followed by a layer of Stampin’ Up Blushing Bride that’s been dry embossed and distressed. I placed a Zva Creative crystal embellie over top of both of these layers. Next I punched three circles, with the top one inked with the sentiment. The sentiment has been popped up on dimensionals. The layer in the designer paper has also been distressed and inked. I felted some of the Stampin’ Up Basic Gray card stock. If you’re not familiar with the term…it was spritzed with water and crumpled till it has a felt sort of finish. Then I punched it twice to make the leaves. Accessories: Big Shot, SU Lattice Embossing Folder, 1 1/4″, 1 3/8″ and 1 3/4″ circle punches, Sizzlets Little Leaves, Zva Creative Crystal leaves, dimensionals, distressing tool. The ribbon flowers are made with white seam binding, Tattered Rose Distress Ink, water spritzer, needle, thread, craft sheet, heat gun and SU Crystal Effects. Spectacular roses – thanks for the mini-tutorial on how to do it … certainly going to give this a try!